For other uses, see Parallax (disambiguation). A simplified illustration of the parallax of an object against a distant background due to a perspective shift. When viewed from "Viewpoint A", the object appears to be in front of the blue square. When the viewpoint is changed to "Viewpoint B", the object appears to have moved in front of the red square. This animation is an example of parallax. As the viewpoint moves side to side, the objects in the distance appear to move more slowly than the objects close to the camera. In this case, the blue cube in front appears to move faster than the red cube. Parallax (from Ancient Greek παράλλαξις (parallaxis), meaning 'alternation') is a displacement or difference in the apparent position of an object viewed along two different lines of sight, and is measured by the angle or semi-angle of inclination between those two lines. Due to foreshortening, nearby objects show a larger parallax than farther objects when observed from different positions, so parallax can be used to determine distances. To measure large distances, such as the distance of a planet or a star from Earth, astronomers use the principle of parallax. Here, the term parallax is the semi-angle of inclination between two sight-lines to the star, as observed when Earth is on opposite sides of the Sun in its orbit. These distances form the lowest rung of what is called "the cosmic distance ladder", the first in a succession of methods by which astronomers determine the distances to celestial objects, serving as a basis for other distance measurements in astronomy forming the higher rungs of the ladder. As the eyes of humans and other animals are in different positions on the head, they present different views simultaneously. This is the basis of stereopsis, the process by which the brain exploits the parallax due to the different views from the eye to gain depth perception and estimate distances to objects. Animals also use motion parallax, in which the animals (or just the head) move to gain different viewpoints. For example, pigeons (whose eyes do not have overlapping fields of view and thus cannot use stereopsis) bob their heads up and down to see depth. The motion parallax is exploited also in wiggle stereoscopy, computer graphics which provide depth cues through viewpoint-shifting animation rather than through binocular vision. Parallax is an angle subtended by a line on a point. In the upper diagram, the earth in its orbit sweeps the parallax angle subtended on the sun. The lower diagram shows an equal angle swept by the sun in a geostatic model. A similar diagram can be drawn for a star except that the angle of parallax would be minuscule. Parallax arises due to change in viewpoint occurring due to motion of the observer, of the observed, or of both. What is essential is relative motion. By observing parallax, measuring angles, and using geometry, one can determine distance. Astronomers also use the word "parallax" as a synonym for "distance measurement" by other methods: see parallax (disambiguation)#Astronomy. Stellar parallax created by the relative motion between the Earth and a star can be seen, in the Copernican model, as arising from the orbit of the Earth around the Sun: the star only appears to move relative to more distant objects in the sky. In a geostatic model, the movement of the star would have to be taken as real with the star oscillating across the sky with respect to the background stars. Stellar parallax is most often measured using annual parallax, defined as the difference in position of a star as seen from the Earth and Sun, i. e. the angle subtended at a star by the mean radius of the Earth's orbit around the Sun. The parsec (3.26 light-years) is defined as the distance for which the annual parallax is 1 arcsecond. Annual parallax is normally measured by observing the position of a star at different times of the year as the Earth moves through its orbit. Measurement of annual parallax was the first reliable way to determine the distances to the closest stars. The first successful measurements of stellar parallax were made by Friedrich Bessel in 1838 for the star 61 Cygni using a heliometer. Stellar parallax remains the standard for calibrating other measurement methods. Accurate calculations of distance based on stellar parallax require a measurement of the distance from the Earth to the Sun, now based on radar reflection off the surfaces of planets. The angles involved in these calculations are very small and thus difficult to measure. The nearest star to the Sun (and thus the star with the largest parallax), Proxima Centauri, has a parallax of 0.7687 ± 0.0003 arcsec. This angle is approximately that subtended by an object 2 centimeters in diameter located 5.3 kilometers away. Hubble Space Telescope – Spatial scanning precisely measures distances up to 10,000 light-years away (10 April 2014). The fact that stellar parallax was so small that it was unobservable at the time was used as the main scientific argument against heliocentrism during the early modern age. It is clear from Euclid's geometry that the effect would be undetectable if the stars were far enough away, but for various reasons such gigantic distances involved seemed entirely implausible: it was one of Tycho's principal objections to Copernican heliocentrism that in order for it to be compatible with the lack of observable stellar parallax, there would have to be an enormous and unlikely void between the orbit of Saturn (then the most distant known planet) and the eighth sphere (the fixed stars). In 1989, the satellite Hipparcos was launched primarily for obtaining improved parallaxes and proper motions for over 100,000 nearby stars, increasing the reach of the method tenfold. Even so, Hipparcos is only able to measure parallax angles for stars up to about 1,600 light-years away, a little more than one percent of the diameter of the Milky Way Galaxy. The European Space Agency's Gaia mission, launched in December 2013, will be able to measure parallax angles to an accuracy of 10 microarcseconds, thus mapping nearby stars (and potentially planets) up to a distance of tens of thousands of light-years from Earth. In April 2014, NASA astronomers reported that the Hubble Space Telescope, by using spatial scanning, can now precisely measure distances up to 10,000 light-years away, a ten-fold improvement over earlier measurements. Distance measurement by parallax is a special case of the principle of triangulation, which states that one can solve for all the sides and angles in a network of triangles if, in addition to all the angles in the network, the length of at least one side has been measured. Thus, the careful measurement of the length of one baseline can fix the scale of an entire triangulation network. In parallax, the triangle is extremely long and narrow, and by measuring both its shortest side (the motion of the observer) and the small top angle (always less than 1 arcsecond, leaving the other two close to 90 degrees), the length of the long sides (in practice considered to be equal) can be determined. For example, the distance to Proxima Centauri is 1/0.7687=1.3009 parsecs (4.243 ly). Diurnal parallax is a parallax that varies with rotation of the Earth or with difference of location on the Earth. The Moon and to a smaller extent the terrestrial planets or asteroids seen from different viewing positions on the Earth (at one given moment) can appear differently placed against the background of fixed stars. Lunar parallax (often short for lunar horizontal parallax or lunar equatorial horizontal parallax), is a special case of (diurnal) parallax: the Moon, being the nearest celestial body, has by far the largest maximum parallax of any celestial body, it can exceed 1 degree. 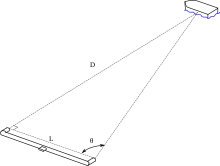 The diagram (above) for stellar parallax can illustrate lunar parallax as well, if the diagram is taken to be scaled right down and slightly modified. Instead of 'near star', read 'Moon', and instead of taking the circle at the bottom of the diagram to represent the size of the Earth's orbit around the Sun, take it to be the size of the Earth's globe, and of a circle around the Earth's surface. Then, the lunar (horizontal) parallax amounts to the difference in angular position, relative to the background of distant stars, of the Moon as seen from two different viewing positions on the Earth: one of the viewing positions is the place from which the Moon can be seen directly overhead at a given moment (that is, viewed along the vertical line in the diagram); and the other viewing position is a place from which the Moon can be seen on the horizon at the same moment (that is, viewed along one of the diagonal lines, from an Earth-surface position corresponding roughly to one of the blue dots on the modified diagram). The lunar (horizontal) parallax can alternatively be defined as the angle subtended at the distance of the Moon by the radius of the Earth—equal to angle p in the diagram when scaled-down and modified as mentioned above. The lunar horizontal parallax at any time depends on the linear distance of the Moon from the Earth. The Earth–Moon linear distance varies continuously as the Moon follows its perturbed and approximately elliptical orbit around the Earth. The range of the variation in linear distance is from about 56 to 63.7 Earth radii, corresponding to horizontal parallax of about a degree of arc, but ranging from about 61.4' to about 54'. The Astronomical Almanac and similar publications tabulate the lunar horizontal parallax and/or the linear distance of the Moon from the Earth on a periodical e.g. daily basis for the convenience of astronomers (and of celestial navigators), and the study of the way in which this coordinate varies with time forms part of lunar theory. Parallax can also be used to determine the distance to the Moon. One way to determine the lunar parallax from one location is by using a lunar eclipse. A full shadow of the Earth on the Moon has an apparent radius of curvature equal to the difference between the apparent radii of the Earth and the Sun as seen from the Moon. This radius can be seen to be equal to 0.75 degree, from which (with the solar apparent radius 0.25 degree) we get an Earth apparent radius of 1 degree. This yields for the Earth–Moon distance 60.27 Earth radii or 384,399 kilometres (238,854 mi) This procedure was first used by Aristarchus of Samos and Hipparchus, and later found its way into the work of Ptolemy. The diagram at the right shows how daily lunar parallax arises on the geocentric and geostatic planetary model in which the Earth is at the centre of the planetary system and does not rotate. It also illustrates the important point that parallax need not be caused by any motion of the observer, contrary to some definitions of parallax that say it is, but may arise purely from motion of the observed. Until then, many people had no idea how one could calculate the distance separating the Moon from the Earth. The circumstance was exploited to teach them that this distance was obtained by measuring the parallax of the Moon. If the word parallax appeared to amaze them, they were told that it was the angle subtended by two straight lines running from both ends of the Earth's radius to the Moon. If they had doubts on the perfection of this method, they were immediately shown that not only did this mean distance amount to a whole two hundred thirty-four thousand three hundred and forty-seven miles (94,330 leagues), but also that the astronomers were not in error by more than seventy miles (≈ 30 leagues). After Copernicus proposed his heliocentric system, with the Earth in revolution around the Sun, it was possible to build a model of the whole Solar System without scale. To ascertain the scale, it is necessary only to measure one distance within the Solar System, e.g., the mean distance from the Earth to the Sun (now called an astronomical unit, or AU). When found by triangulation, this is referred to as the solar parallax, the difference in position of the Sun as seen from the Earth's centre and a point one Earth radius away, i. e., the angle subtended at the Sun by the Earth's mean radius. Knowing the solar parallax and the mean Earth radius allows one to calculate the AU, the first, small step on the long road of establishing the size and expansion age of the visible Universe. A primitive way to determine the distance to the Sun in terms of the distance to the Moon was already proposed by Aristarchus of Samos in his book On the Sizes and Distances of the Sun and Moon. He noted that the Sun, Moon, and Earth form a right triangle (with the right angle at the Moon) at the moment of first or last quarter moon. He then estimated that the Moon, Earth, Sun angle was 87°. Using correct geometry but inaccurate observational data, Aristarchus concluded that the Sun was slightly less than 20 times farther away than the Moon. The true value of this angle is close to 89° 50', and the Sun is actually about 390 times farther away. He pointed out that the Moon and Sun have nearly equal apparent angular sizes and therefore their diameters must be in proportion to their distances from Earth. He thus concluded that the Sun was around 20 times larger than the Moon; this conclusion, although incorrect, follows logically from his incorrect data. It does suggest that the Sun is clearly larger than the Earth, which could be taken to support the heliocentric model. Although Aristarchus' results were incorrect due to observational errors, they were based on correct geometric principles of parallax, and became the basis for estimates of the size of the Solar System for almost 2000 years, until the transit of Venus was correctly observed in 1761 and 1769. This method was proposed by Edmond Halley in 1716, although he did not live to see the results. The use of Venus transits was less successful than had been hoped due to the black drop effect, but the resulting estimate, 153 million kilometers, is just 2% above the currently accepted value, 149.6 million kilometers. Much later, the Solar System was "scaled" using the parallax of asteroids, some of which, such as Eros, pass much closer to Earth than Venus. In a favourable opposition, Eros can approach the Earth to within 22 million kilometres. Both the opposition of 1901 and that of 1930/1931 were used for this purpose, the calculations of the latter determination being completed by Astronomer Royal Sir Harold Spencer Jones. Also radar reflections, both off Venus (1958) and off asteroids, like Icarus, have been used for solar parallax determination. Today, use of spacecraft telemetry links has solved this old problem. The currently accepted value of solar parallax is 8".794 143. The open stellar cluster Hyades in Taurus extends over such a large part of the sky, 20 degrees, that the proper motions as derived from astrometry appear to converge with some precision to a perspective point north of Orion. Combining the observed apparent (angular) proper motion in seconds of arc with the also observed true (absolute) receding motion as witnessed by the Doppler redshift of the stellar spectral lines, allows estimation of the distance to the cluster (151 light-years) and its member stars in much the same way as using annual parallax. Dynamical parallax has sometimes also been used to determine the distance to a supernova, when the optical wave front of the outburst is seen to propagate through the surrounding dust clouds at an apparent angular velocity, while its true propagation velocity is known to be the speed of light. , when the parallax is given in arcseconds. Precise parallax measurements of distance have an associated error. However this error in the measured parallax angle does not translate directly into an error for the distance, except for relatively small errors. The reason for this is that an error toward a smaller angle results in a greater error in distance than an error toward a larger angle. where d is the distance and p is the parallax. The approximation is far more accurate for parallax errors that are small relative to the parallax than for relatively large errors. For meaningful results in stellar astronomy, Dutch astronomer Floor van Leeuwen recommends that the parallax error be no more than 10% of the total parallax when computing this error estimate. From enhanced relativistic positioning systems, spatio-temporal parallax generalizing the usual notion of parallax in space only has been developed. Then, eventfields in spacetime can be deduced directly without intermediate models of light bending by massive bodies such as the one used in the PPN formalism for instance. The correct line of sight needs to be used to avoid parallax error. Measurements made by viewing the position of some marker relative to something to be measured are subject to parallax error if the marker is some distance away from the object of measurement and not viewed from the correct position. For example, if measuring the distance between two ticks on a line with a ruler marked on its top surface, the thickness of the ruler will separate its markings from the ticks. If viewed from a position not exactly perpendicular to the ruler, the apparent position will shift and the reading will be less accurate than the ruler is capable of. A similar error occurs when reading the position of a pointer against a scale in an instrument such as an analog multimeter. To help the user avoid this problem, the scale is sometimes printed above a narrow strip of mirror, and the user's eye is positioned so that the pointer obscures its own reflection, guaranteeing that the user's line of sight is perpendicular to the mirror and therefore to the scale. The same effect alters the speed read on a car's speedometer by a driver in front of it and a passenger off to the side, values read from a graticule not in actual contact with the display on an oscilloscope, etc. Aerial picture pairs, when viewed through a stereo viewer, offer a pronounced stereo effect of landscape and buildings. High buildings appear to 'keel over' in the direction away from the centre of the photograph. Measurements of this parallax are used to deduce the height of the buildings, provided that flying height and baseline distances are known. This is a key component to the process of photogrammetry. Parallax error can be seen when taking photos with many types of cameras, such as twin-lens reflex cameras and those including viewfinders (such as rangefinder cameras). In such cameras, the eye sees the subject through different optics (the viewfinder, or a second lens) than the one through which the photo is taken. As the viewfinder is often found above the lens of the camera, photos with parallax error are often slightly lower than intended, the classic example being the image of person with his or her head cropped off. This problem is addressed in single-lens reflex cameras, in which the viewfinder sees through the same lens through which the photo is taken (with the aid of a movable mirror), thus avoiding parallax error. Parallax is also an issue in image stitching, such as for panoramas. Parallax affects sighting devices of ranged weapons in many ways. On sights fitted on small arms and bows, etc. the perpendicular distance between the sight and the weapon's launch axis (e.g. the bore axis of a gun) — generally referred to as "sight height" — can induce significant aiming errors when shooting at close range, particularly when shooting at small targets. This parallax error is compensated for (when needed) via calculations that also take in other variables such as bullet drop, windage, and the distance at which the target is expected to be. Sight height can be used to advantage when "sighting-in" rifles for field use. A typical hunting rifle (.222 with telescopic sights) sighted-in at 75m will still be useful from 50m to 200m without needing further adjustment. In some reticled optical instruments such as telescopes, microscopes or in telescopic sights ("scopes") used on small arms and theodolites, parallax can create problems when the reticle is not coincident with the focal plane of the target image. This is because when the reticle and the target are not at the same focus, the optically corresponded distances being projected through the eyepiece are also different, and the user's eye will register the difference in parallaxes between the reticle and the target (whenever eye position changes) as a relative displacement on top of each other. The term parallax shift refers to that resultant apparent "floating" movements of the reticle over the target image when the user moves his/her head/eye laterally (up/down or left/right) behind the sight, i.e. an error where the reticle does not stay aligned with the user's optical axis. Some firearm scopes are equipped with a parallax compensation mechanism, which basically consists of a movable optical element that enables the optical system to shift the focus of the target image at varying distances into exactly the same optical plane of the reticle (or vice versa). Many low-tier telescopic sights may have no parallax compensation because in practice they can still perform very acceptably without eliminating parallax shift, in which case the scope is often set fixed at a designated parallax-free distance that best suits their intended usage. Typical standard factory parallax-free distances for hunting scopes are 100 yd (or 100 m) to make them suited for hunting shots that rarely exceed 300 yd/m. Some competition and military-style scopes without parallax compensation may be adjusted to be parallax free at ranges up to 300 yd/m to make them better suited for aiming at longer ranges. Scopes for guns with shorter practical ranges, such as airguns, rimfire rifles, shotguns and muzzleloaders, will have parallax settings for shorter distances, commonly 50 yd/m for rimfire scopes and 100 yd/m for shotguns and muzzleloaders. Airgun scopes are very often found with adjustable parallax, usually in the form of an adjustable objective (or "AO" for short) design, and may adjust down to as near as 3 yards (2.7 metres). Non-magnifying reflector or "reflex" sights have the ability to be theoretically "parallax free." But since these sights use parallel collimated light this is only true when the target is at infinity. At finite distances eye movement perpendicular to the device will cause parallax movement in the reticle image in exact relationship to eye position in the cylindrical column of light created by the collimating optics. Firearm sights, such as some red dot sights, try to correct for this via not focusing the reticle at infinity, but instead at some finite distance, a designed target range where the reticle will show very little movement due to parallax. Some manufactures market reflector sight models they call "parallax free," but this refers to an optical system that compensates for off axis spherical aberration, an optical error induced by the spherical mirror used in the sight that can cause the reticle position to diverge off the sight's optical axis with change in eye position. Because of the positioning of field or naval artillery guns, each one has a slightly different perspective of the target relative to the location of the fire-control system itself. Therefore, when aiming its guns at the target, the fire control system must compensate for parallax in order to assure that fire from each gun converges on the target. A coincidence rangefinder or parallax rangefinder can be used to find distance to a target. In a philosophic/geometric sense: an apparent change in the direction of an object, caused by a change in observational position that provides a new line of sight. The apparent displacement, or difference of position, of an object, as seen from two different stations, or points of view. In contemporary writing parallax can also be the same story, or a similar story from approximately the same time line, from one book told from a different perspective in another book. The word and concept feature prominently in James Joyce's 1922 novel, Ulysses. Orson Scott Card also used the term when referring to Ender's Shadow as compared to Ender's Game. The philosophical twist to be added (to parallax), of course, is that the observed distance is not simply subjective, since the same object that exists 'out there' is seen from two different stances, or points of view. It is rather that, as Hegel would have put it, subject and object are inherently mediated so that an 'epistemological' shift in the subject's point of view always reflects an ontological shift in the object itself. Or—to put it in Lacanese—the subject's gaze is always-already inscribed into the perceived object itself, in the guise of its 'blind spot,' that which is 'in the object more than object itself', the point from which the object itself returns the gaze. Sure the picture is in my eye, but I am also in the picture. Refraction, a visually similar principle caused by water, etc. ^ "Parallax". Oxford English Dictionary (Second ed.). 1989. Astron. Apparent displacement, or difference in the apparent position, of an object, caused by actual change (or difference) of position of the point of observation; spec. the angular amount of such displacement or difference of position, being the angle contained between the two straight lines drawn to the object from the two different points of view, and constituting a measure of the distance of the object. ^ In the past diurnal parallax was also used to measure distances to celestial objects within the Solar System. This method has now been superseded by more accurate techniques. ^ Steinman, Scott B.; Garzia, Ralph Philip (2000). Foundations of Binocular Vision: A Clinical perspective. McGraw-Hill Professional. pp. 2–5. ISBN 978-0-8385-2670-5. ^ Steinman & Garzia 2000, p. 180. ^ a b Zeilik & Gregory 1998, p. 44. ^ Zeilik & Gregory 1998, § 22-3. ^ a b Benedict, G. Fritz, et al. (1999). "Interferometric Astrometry of Proxima Centauri and Barnard's Star Using Hubble Space Telescope Fine Guidance Sensor 3: Detection Limits for Substellar Companions". The Astronomical Journal. 118 (2): 1086–1100. arXiv:astro-ph/9905318. Bibcode:1999AJ....118.1086B. doi:10.1086/300975. ^ a b Harrington, J.D. ; Villard, Ray (10 April 2014). "NASA's Hubble Extends Stellar Tape Measure 10 Times Farther Into Space". NASA. Archived from the original on 12 April 2014. Retrieved 11 April 2014. ^ "Soyuz ST-B successfully launches Gaia space observatory". nasaspaceflight.com. 19 December 2013. Archived from the original on 19 December 2013. Retrieved 19 December 2013. ^ Henney, Paul J. "ESA's Gaia Mission to study stars". Astronomy Today. Archived from the original on 2008-03-17. Retrieved 2008-03-08. ^ Seidelmann, P. Kenneth (2005). Explanatory Supplement to the Astronomical Almanac. University Science Books. pp. 123–125. ISBN 978-1-891389-45-0. ^ Barbieri, Cesare (2007). Fundamentals of astronomy. CRC Press. pp. 132–135. ISBN 978-0-7503-0886-1. ^ a b c Gutzwiller, Martin C. (1998). "Moon–Earth–Sun: The oldest three-body problem". Reviews of Modern Physics. 70 (2): 589–639. Bibcode:1998RvMP...70..589G. doi:10.1103/RevModPhys.70.589. ^ Webb, Stephen (1999), "3.2 Aristarchus, Hipparchus, and Ptolemy", Measuring the Universe: The Cosmological Distance Ladder, Springer, pp. 27–35, ISBN 9781852331061 . See in particular p. 33: "Almost everything we know about Hipparchus comes down to us by way of Ptolemy." ^ Freedman, W.L. (2000). "The Hubble constant and the expansion age of the Universe". Physics Reports. 333 (1): 13–31. arXiv:astro-ph/9909076. Bibcode:2000PhR...333...13F. doi:10.1016/S0370-1573(00)00013-2. ^ Al-Khalili, Jim (2010), Pathfinders: The Golden Age of Arabic Science, Penguin UK, p. 270, ISBN 9780141965017, archived from the original on 2015-03-17, Some have suggested that his calculation of the relative size of the earth and sun led Aristarchus to conclude that it made more sense for the earth to be moving around the much larger sun than the other way round. ^ Whipple 2007, p. 47. ^ Whipple 2007, p. 117. ^ Vijay K. Narayanan; Andrew Gould (1999). "A Precision Test of Hipparcos Systematics toward the Hyades". The Astrophysical Journal. 515 (1): 256. arXiv:astro-ph/9808284. Bibcode:1999ApJ...515..256N. doi:10.1086/307021. ^ Panagia, N.; Gilmozzi, R.; MacChetto, F.; Adorf, H.-M.; et al. (1991). "Properties of the SN 1987A circumstellar ring and the distance to the Large Magellanic Cloud". The Astrophysical Journal. 380: L23. Bibcode:1991ApJ...380L..23P. doi:10.1086/186164. ^ Similar derivations are in most astronomy textbooks. See, e.g., Zeilik & Gregory 1998, § 11-1. ^ van Leeuwen, Floor (2007). Hipparcos, the new reduction of the raw data. Astrophysics and space science library. 350. Springer. p. 86. ISBN 978-1-4020-6341-1. Archived from the original on 2015-03-18. ^ Rubin, J.L. (2015). "Relativistic Pentametric Coordinates from Relativistic Localizing Systems and the Projective Geometry of the Spacetime Manifold". Electronic Journal of Theoretical Physics. 12 (32): 83–112. Archived from the original on 2015-02-08. ^ "Ballistic Explorer Help". www.dexadine.com. Archived from the original on 2011-09-28. ^ "Crossbows / Arrows & Bolts / Trajectory / Trajectories". www.crossbowmen.com. Archived from the original on 2011-07-08. ^ a b "Encyclopedia of Bullseye Pistol". www.bullseyepistol.com. Archived from the original on 2011-07-08. ^ AFMOTGN (24 July 2008). "Aimpoint's parallax-free, double lens system... AFMO.com". Archived from the original on 2 July 2016 – via YouTube. ^ AR15.COM. "How Aimpoints, EOTechs, And Other Parallax-Free Optics Work – AR15.COM". www.ar15.com. ^ "Gunsight – Patent 5901452 – general description of a mangin mirror system". Archived from the original on 2012-10-07. ^ Žižek, Slavoj (2006). The Parallax View. The MIT Press. p. 17. ISBN 978-0-262-24051-2. Hirshfeld, Alan w. (2001). Parallax: The Race to Measure the Cosmos. New York: W.H. Freeman. ISBN 978-0-7167-3711-7. Whipple, Fred L. (2007). Earth Moon and Planets. Read Books. ISBN 978-1-4067-6413-0. .
Zeilik, Michael A.; Gregory, Stephan A. (1998). Introductory Astronomy & Astrophysics (4th ed.). Saunders College Publishing. ISBN 978-0-03-006228-5. .
"Sun, Parallax of the" . Collier's New Encyclopedia. 1921.